Roasted chestnuts - this is the only time of year I ever see fresh chestnuts in the store, so I got about half a pound to try them out. I liked them best fresh from the oven, but cold is ok. They definitely have a unique flavor and texture. Fresh pomegranate - this is the time of year for fresh pomegranates, too, and I find popping the seeds out of the membranes oddly satisfying. Not an activity to do while you're wearing a white shirt though, which I learned the stupid way. 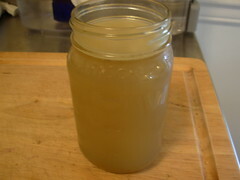 Turkey stock - I finally FINALLY figured out how to make good tasting chicken or turkey stock. Ugh, took me long enough. This will get a recipe post by itself at some point. The batch I made this week was made with turkey legs and it turned to gel in the fridge. I get a kick out of that every damn time. Hash - I made the turkey stock and had a bunch of leftover meat I picked off the bones, so I made some kind of hash using turkey meat for lunch almost every day. 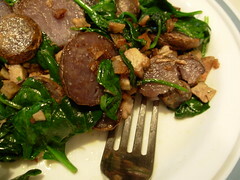 My favorite one was purple potatoes, shiitake mushrooms, spinach, garlic, turkey thigh meat, and cubed country style pate (storebought) that I cooked in butter. 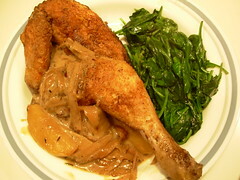 Chicken Normandy - I got the recipe from Simply Recipes. Basically chicken cooked with loads of apples, onions, and heavy cream. Absolutely delicious. The leftover sauce made its way into a hash the next day, along with some bacon. 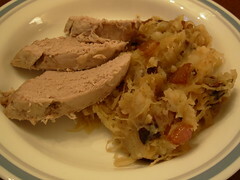 Pork with sauerkraut mashed potatoes - this was a recipe from The New German Cookbook. Pork tenderloin poached in my homemade turkey stock and white wine, along with potatoes mashed with wine-spiked sauerkraut, bacon, and caramelized onions. The potato stuff was great and the pork was very tender, although I wish it had been fattier. 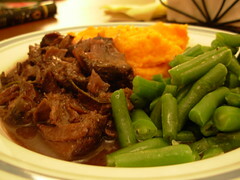 Braised beef shank - basically one of my old recipes, although I have since added some tweaks for maximum deliciousness. The major thing is to take the cooking liquid and boil it down until it's reduced by about half and then thicken it up with a little arrowroot to make it like gravy. Then mix the shredded beef/marrow back into it. Also you can do it in a crockpot on low for 8 hours. We had it with lemony sweet potatoes (recipe from Nourishing Traditions, containing loads of butter, lemon, and egg yolks) and buttered green beans. Looks like a fun meal you have never mind if there's too much cake included. thanks a lot now I have got the thing i always was looking for respect. A reservoir of innovation. Reaped from the most popular designers and the new prominent. You are invited to be impressed with Amber’s selection of wedding dresses 2012, by virtue of an incredible amount of self-motivated ideas that sparkling around. Have a digging-out on our span-new designer lace wedding dress that are tagged into distinctive genre and style simple wedding dresses. This chicken Normandy recipe makes my hungry. What does it taste? Is it sweet? Pork is horrible for you and potatoes are not paleo. Just saying.